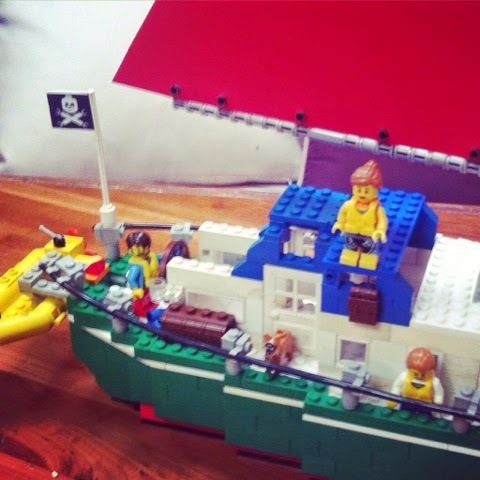 On a recent visit our Boy’s Uncle and Aunt, aka Gordon’s brother and his wife, T & E, gifted us the most unbelievable and uniquely special gift, a Lego rendition of our dear Good Ship Monster. True to the real thing she features tanbark sails, our prominent railing, a blue canvas Bimini even the graceful sweep of our bow. There’s lifejackets, binoculars, and a deck box full of tools. 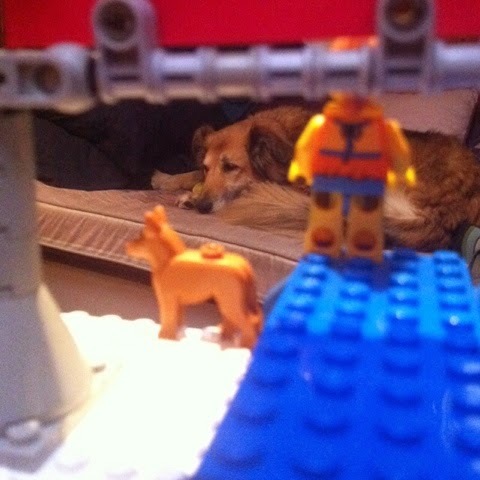 Lego memes of our whole family, including the dog are aboard. 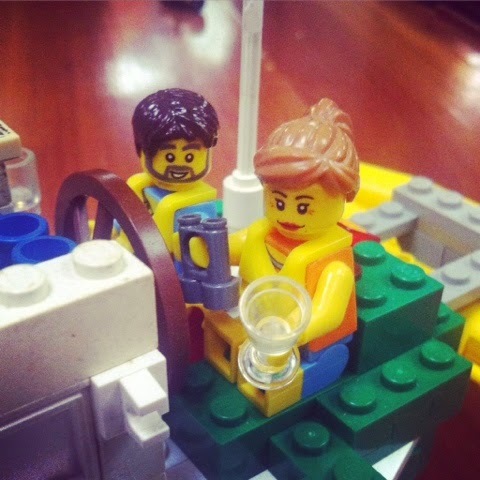 It’s definitely smile worthy to see your Lego self, and I’m pretty true to form in a floral halter top with denim shorts and my wine glass. My head spins around to reveal an angry face too! Gordon is wearing a pair of red jeans… a nod to his past (don’t ask!) and a tropical shirt. Our Boy is donned in a wee sailor’s outfit and both Boys have the obligatory Captain’s hats. 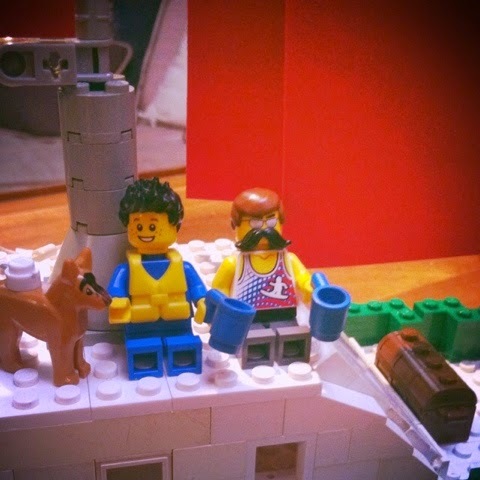 Our RIB, which hangs from it’s Lego davits off the stern, is all set for our deep sea exploration adventures, and Gordon’s and I’s Lego selves have the necessary dive suits as well. 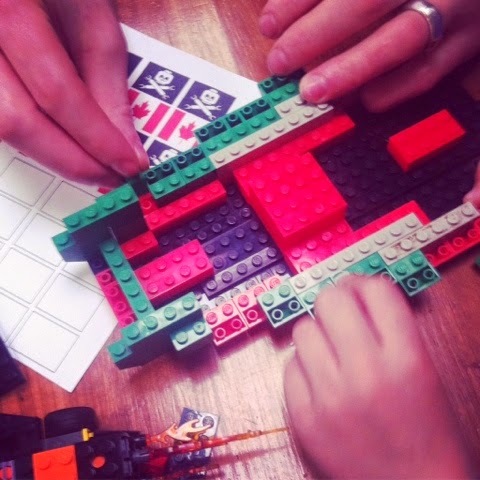 What makes this truly special is all the time and effort T & E put into designing and then rendering our Monster in a Lego Design program. We have all the instructions to rebuild Monster if we should ever choose to take all that Lego apart, all 875 pieces. If you have seen the Lego Movie, you’ll know what I mean by, ‘Where’s the Kragle?’! It was quite special and heartwarming in itself to watch the Boy and his Uncle building our boat together. I must add that T & E were also our first official guests aboard Monster. Our salon settees became their bunks, and the whole experience went smoothly, other than the cold that made it’s rounds. Beginning with our Boy, and then soon after both T & E were suffering. There’s nothing like having house guests that are cuddled up under blankets sipping herbal tea and vitamin C enhanced water, as G said. Hopefully upon their next visit we’ll actually be able to get out sailing, and let them experience what Monster really has to offer. 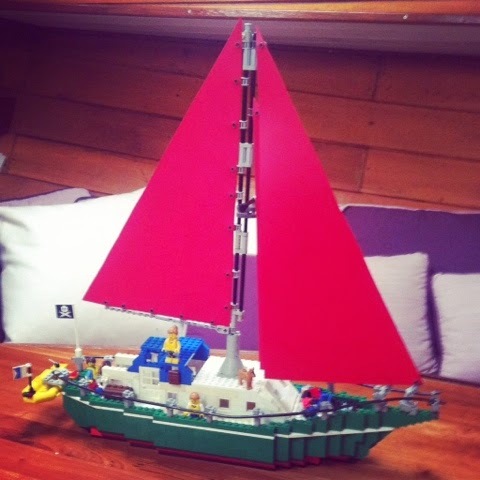 Until that next time T & E’s Lego memes will just have to live and sail vicariously aboard the Lego Monster. Relaxing with their herbal tea on our foredeck. 😉 Thank you so much for your visit and building these wonderful memories with us!